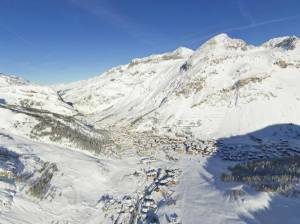 Val d’Isere, France – After being left high and dry for the holiday week, French ski resorts have received as much as 30cm of new snow in recent days to finally jump-start the ski season. With that new snow, however, have come avalanches. In the Savoie region, police officials in Courchevel have reported as many as eight separate avalanches on Tuesday alone. It wasn’t immediately clear if any skiers were caught in those slides. In nearby Val d’Isere, however, two off-piste skiers died in two separate avalanches on Tuesday. One killed a 37-year-old Spaniard, after it buried him under 150cm of snow. A second slide took the life of a unnamed French skier. A 30-year-old Czech skier was much more fortunate in Saint-Colomban-des-Villards, when an avalanche near the resort of Sybelles left him injured but alive. An avalanche risk rated between 4 and 5 on Tuesday is said to have been caused by winds cross-loading many of the steep slopes in the region. Tuesday’s deaths in Val d’Isere come just days after two Lithuanian mountain climbers were killed when they were struck by an avalanche at an elevation of 10,500 feet above the resort town of Argentiere, 30 miles north of Val d’Isere near Mont Blanc.